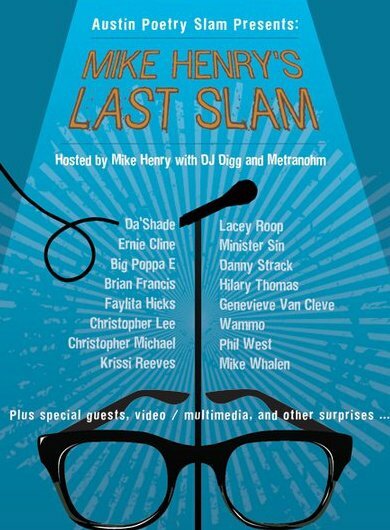 From the getting things done department... After 15 years in the game, the current Slammaster, Mike Henry, of the Austin Poetry Slam is stepping down tonight with one last slam. Check out the Austin Poetry Slam tonight @ ND @ 501 Studios! Ernie Cline, Da'Shade, Big Poppa E, Brian Francis, Faylita Hicks, Christopher Lee, Christopher Michael, Zell Miller III, Krissi Reeves, Lacey Roop, Minister Sin, Danny Strack, Hilary Thomas, Genevieve Van Cleve, Wammo, Phil West and Funky Mike Whalen.